We’re proud of our excellent fundraising abilities. However, what’s even more important than the money we raise is what we do with it. We are extremely careful with the dollars you have entrusted to our care. For more information about our financial history and spending, please review the Financial Statements and Form 990s posted below. We invite you to read our latest financials to learn more about us and the work we do, and to become inspired to share in our promise. CCF has been operating for 31 years under the guidance of Jane G. Ellis, President & Executive Director. CCF is overseen by an 8 member volunteer Board of Directors and an 16 member volunteer Advisory Board. 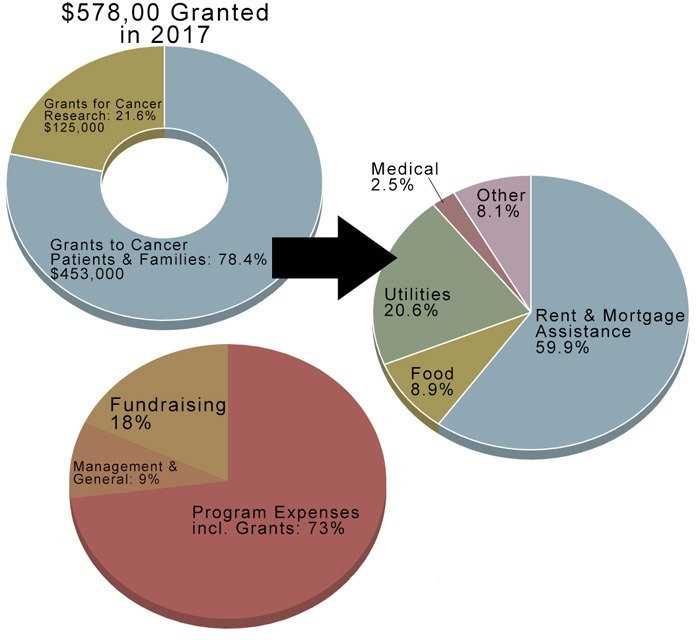 CCF supporters can be assured that their generous donations are most effectively being used to help ease the financial burdens of Connecticut families due to a cancer diagnosis. CCF has been audited annually by an independent accounting firm for the past 31 years and is presently audited by Capossela Cohen, LLC.